The Guyette, Schmidt & Deeter November 9 and 10, 2011 auction set multiple auction records. The sale grossed $2.02 million, with 35 lots selling over $10,000. Full size standing redhead drake by Elmer Crowell. Pair of bluewing teal by Mason Decoy Factory. Premier grade blackduck by Mason Decoy Factory. Challenge grade greenwing teal hen by Mason Decoy Factory. Rigmate pair of mallards by Charles Bergman. Canvasback drake by Charles Bergman. Goldeneye drake by Amos Wheaton. Pair of mergansers from Pleasantville, New Jersey. Merganser hen by Harry M. Shourds. Pair of miniature ruddy ducks by George Boyd. Two golden plover from Quogue, Long Island, New York. Lesser scaup drake by Captain ben Dye. Swan decoy by John Cockey. Rare set of 14 miniatures by Joseph Lincoln. Miniature flying blackduck by Elmer Crowell. "Lowhead" mallard drake by William Quinn. Preening mallard hen by Frederick, Joefrau, and LaFrance. Rainbow trout by Kenneth Bruning. Rigmate pair of redheads by Harry M. Shourds. Exceptional bluewing teal hen by Robert Elliston. Semipalmated plover by Elmer Crowell. Rock bass fish model by Oscar Peterson. "Fat jaw" model bluebill drake by the Ward Brothers. Important swan by John Williams. Canada goose by Phineas Reeves. Premier grade Canada goose by Mason Decoy Factory. Premier grade bluewing teal by Mason Decoy Factory. Pair of oversized canvasbacks by the Ward Brothers. Decorative Canada goose by Lem Ward. Decorative pintail drake by the Ward Brothers. Lesser yellowlegs by Ira Hudson. Canada goose weathervane by Elmer Crowell. Special order blackduck by Ira Hudson. Flying mallard drake by Ira Hudson. 2/3 size flying pintails by Ira Hudson. Full size swan with open wings. Robin snipe by Harry V. Shourds. Black bellied plover by Harry V. Shourds. Canada goose by Hays Decoy Factory. Rare brant by Ira Hudson. Hollow carved blackduck by Ira Hudson. 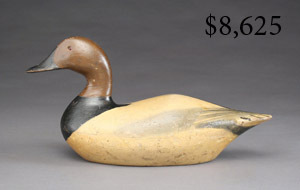 Hollow carved canvasback drake by John R. Wells. Canada goose by George Boyd. Widgeon drake by Lloyd Sterling. Long billed curlew by Thomas Gelston. Preening widgeon drake by the Ward Brothers.